sitting just off the main runway entrance at Michael's AAF in the West Desert of Utah. 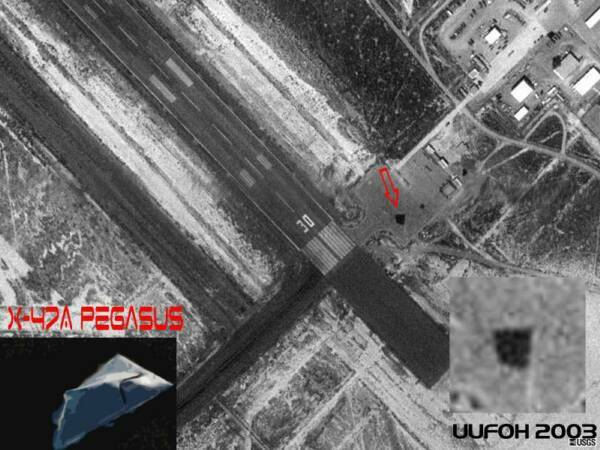 The lack of detail on the black, non reflective, stealth 'skin' of the craft in this black & white 1998' satellite photo, cannot positively show if its an unmanned version or if it is indeed a X-47A craft. Note: photo insert:of the newly released X-47A is strikingly similar in shape to the one found in the terraserver photo. As I do not know the approx. size / dimensions of the new X-47A, it might be another version or prototype with a similar shape or design. It does look to be quite large compared to the cars in the parking lot. (my guess: 45' to 50' feet in length & 30' to 40' feet in width.) the large size would suggest its possibly a manned version? The Michael AAF runway doesn't show up on the Topo USA 4.0 program I have, but several other airstrips farther west into the testing grounds do appear on the program. One shows a runway near the western Dugway border running in a northwest -southeast direction being 2.2 miles long. 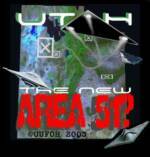 12/21/2003 Re: X-47A? in 1998? It certainly is not a US plane in the "open" inventory. Such poor resolution does not permit me to estimate if it is manned or unmanned, nor to distinguish it from X-47A, X-33a, or other craft which "doesn't exist". It does not look like a Predator drone. 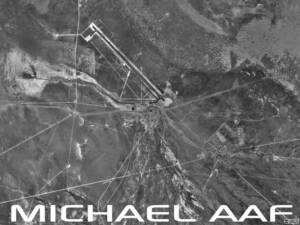 a Top Secret US Military Testing Ground ? X-47A at Michael AAF, DUGWAY, UTAH in 1998? According to Time Magazine, in an article called "100 years of powered flight" the first time the X-47A unmanned drone flew was in a California test range, spring of 2003. I did find the site that you found the picture of the craft on the tarmac at Michael. It is likely the Aurora, which does have anit-gravitic capabilities, as was witnessed by an associate during at NASA reviewed launch from McClellan AFB on Feb 10, 1995 at 2210 (according to my logs). This is a very big plane, which a wingspan of over 200 feet. The underground part of Dugway strongly confirms what we have been saying about that place.